We would like you to meet Dr. Pornthep and his team of specialist Plastic and Reconstructive Surgeons that will help to ensure your surgery runs smoothly with an optical outcome! Exclusive to CosMediTour, Dr. Pornthep is one of Thailand’s most in demand and well known Plastic and Reconstructive Surgeons. He has operated on over 1,000 happy CosMediTour clients and is best known for his breast and body surgery. What does Dr. Pornthep’s specialist team do? Many leading Plastic Surgeons, in Australia, Thailand and other countries, engage a surgical assistant, especially when the surgery procedures involved are time-consuming procedures requiring extended time for the patient to be sedated under General Anaesthesia. A surgical assistant is a medical professional who assists the surgeon both prior to and following the surgery. Depending on the surgeon in Australia, Thailand or elsewhere, the surgical assistant could be a nurse, licensed doctor, licensed doctor enrolled in specialist training, or even a qualified specialist such as another Plastic and Reconstructive Surgeon. When you book Dr Pornthep as your CosMediTour Surgeon you can rest assured that Dr. Pornthep performs 100% of the key elements of his surgeries. This includes the pre surgery consultation, the surgical planning and mark up, all surgery incisions, all surgery and all deep internal suturing. 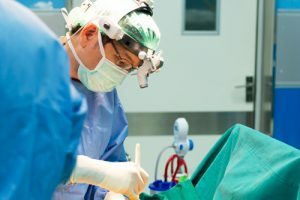 In Dr. Pornthep’s case he engages his own team of carefully selected and fully qualified Plastic and Reconstructive surgeons to assist in Theatre with some of the time-consuming external suturing, and only in selected cases. Some surgery cases require hundreds of internal and external sutures, especially with multiple surgery procedures such Mummy Makeover with breast lifts, breast reductions, tummy tucks, extended tummy tucks and belt lipectomies. 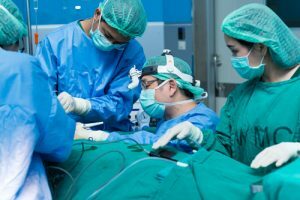 What is the benefit of having a Surgical Assistant? Potential surgeon fatigue is minimised, as fatigue can compromise the final aesthetic outcome of suturing. With Dr. Pornthep and his team of assistant Plastic and Reconstructive Surgeons, there is an additional very significant benefit. You have the extra reassurance knowing you will always have three qualified medical specialists in attendance during your operation, while you are sedated under General Anaesthesia – two Plastic and Reconstructive Surgeons and one Specialist Anaesthetist. 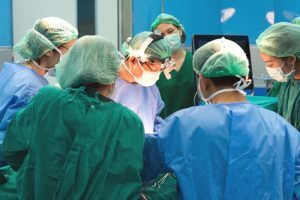 Three specialist doctors in theatre means these surgeons and anaesthetist have between them more than 30 years of formal medical training, prior to performing as a team in the Operating Theatre. As a result of implementing this team of Specialists, the operation process is made simpler, faster, safer and with an optimal surgical outcome.